Karate originated on the Japanese island of Okinawa. The sport is derived from Chinese martial arts and was brought to Japan in the early 20th century. Besides being a combat sport, Karate can also be practiced as a method of self-defense training or as an art of self-development, known as budo. Until the end of the World War II, karate was only practiced in Okinawa. However, the sport quickly became popular among American soldiers stationed on the island who brought it to the western civilization after the war. Between 1960 and 1970 many martial arts movies were made that contributed significantly to the worldwide spread of the sport. Today, Karate is usually used as a generic term for oriental martial arts and not necessarily for the sport itself. Unfortunately, despite its enormous popularity, karate is not considered an Olympic sport. Karate training is divided into Kihon, or basic techniques; Kata, that represents a series of predetermined movements using offensive and defensive postures; and sparring, or Kumite, that refers to training against an adversary. During training, practitioners focus on developing striking techniques such as punching, kicking, knee striking, elbow striking, as well as grappling, throwing or restraining an opponent. Besides a proper method, karate training includes building speed and power. Striking vital points in the human body are also taught. Karate tournaments include sparring, or free Kumite, and individual forms or Kata. The rules used in such competitions are regulated by the World Karate Federation that is the largest international organization of karate including more than 130 countries. Sparring matches or free Kumite are organized on matted square areas with sides of eight meters and involve two opponents who use punching and kicking techniques to score points. While some tournaments allow head, abdomen and groin hits, many karate competitions ban them. 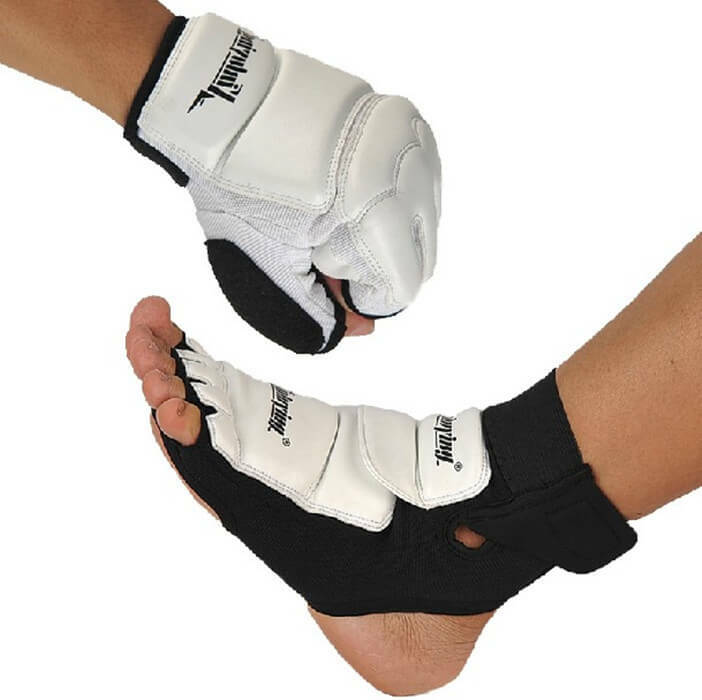 Points are awarded as follows: 1 point for a punch in the chest or stomach; 2 points for a back slap kick; 2 points for a punch or kick at the adversary’s back; 3 points for a face slap kick; 3 points for a sweep or takedown with a follow up technique such as a punch or a stomp. Many styles of karate have been developed over the years. However, the most famous ones are Shotokan, Kyokushin, and Gōjū-ryū. 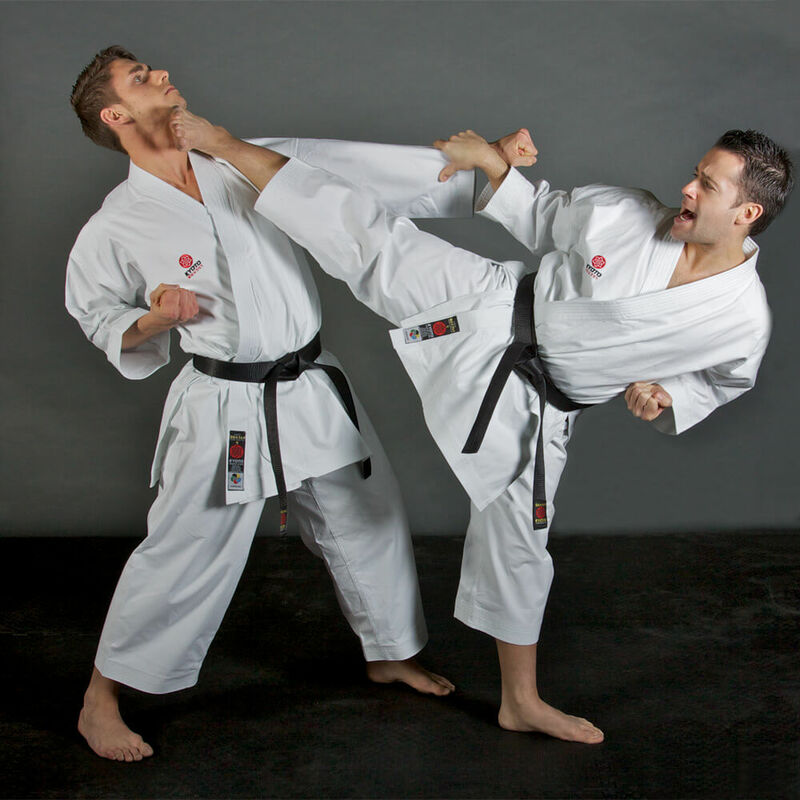 Shotokan is probably the most widely spread style of karate and is regarded as a dynamic martial art that emphasizes in developing speed, strength, and power. Kyokushin is a full contact style of karate that was founded in 1964 by Korean-Japanese Masutatsu Oyama. It is estimated that during the last 40 years there have been more than 12 million Kyokushin practitioners worldwide. Similar to Shotokan, this style of karate focuses on building power and has many techniques that involve kicks to the face. Gōjū-ryū is a traditional Okinawan style of karate that focuses on body strengthening while combining hard and soft techniques. The striking attacks using kicks and close hand punches and open hand circular techniques in order to attack, block or control the opponent are typical for this style. Karate adopted a rank system similar to judo in which the status of a practitioner is determined by the belt color. As a beginner, you start with a white color belt and as you progress and learn various offensive and defensive techniques your climb the ranking leader. Each stage could take a practitioner between eight to eighteen months to master. 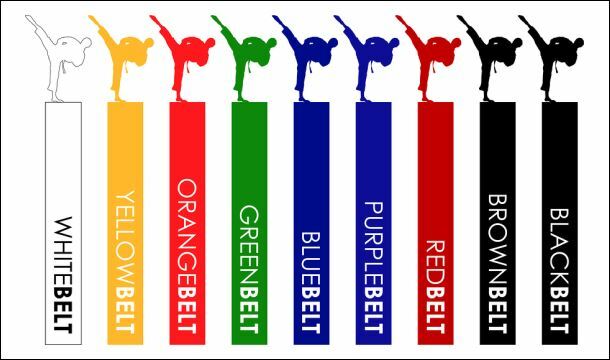 The ranking order reflected by the color of the belt is as follows: white, yellow, orange, blue, green, brown and black. Beyond the black belt, rank is measured in Dan indicating the level of expertise up to the 10th Dan. As the sport of Karate has so many sub-styles, it is hard to create a list of the best karate fighters. However, it’s worth mentioning several fighters who achieved significant results in mixed martial arts competitions. Such a fighter is the former UFC Light Heavyweight Champion Lyoto Machida, who is a Brazilian mixed practitioner who studied Shotokan. His mixed martial arts record encompasses 29 fights from which 22 wins (9 by knockout) and 7 losses. Other famous karate fighters are Sebastiaan “Bas” Rutten with a record of 28 wins, 4 losses, and a draw; and Georges St-Pierre with a record of 25 wins and 2 losses. Many action movie actors are karate practitioners as well. Among them, Chuck Norris, Sean Connery, Dolph Lundgren, Wesley Snipes and Jean-Claude Van Damme are probably the most famous.